This project has been a long time in the making, but from the start there was no doubt as to what the subject matter should be. 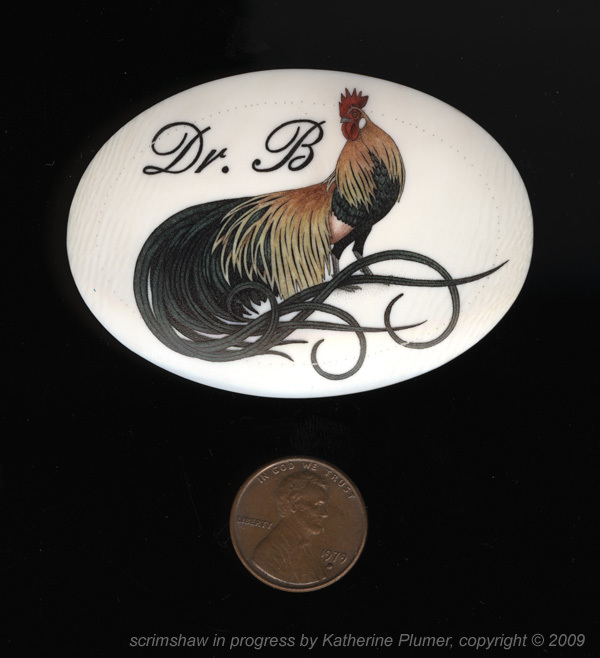 This piece is done as a gift (from a group of people) to honor a professor of Avian Science who has done so much work for exhibition poultry, 4-H, and youth exhibitors over the years.... and who happens to have a particular fondness for belt buckles. 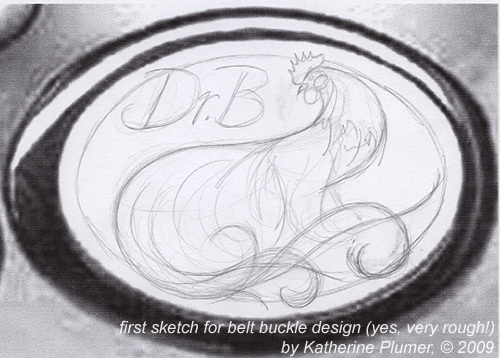 :-) I knew that the Phoenix fowl has a special place in her heart, and thought that breed of chicken would make a great subject for the buckle. But how to do that.... How to fit a very "long" bird into that space. 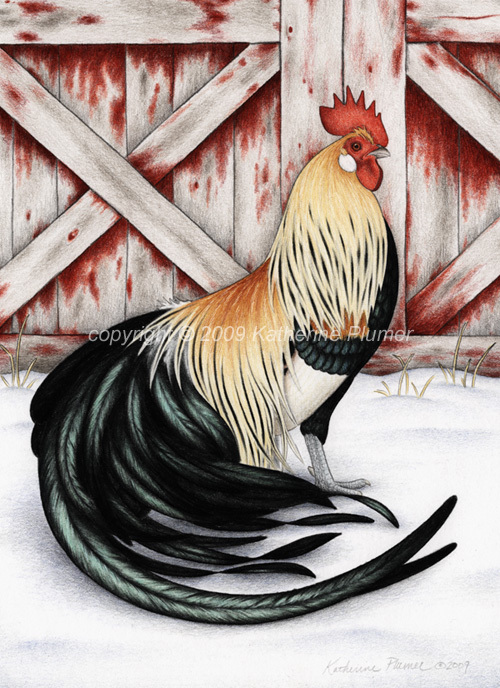 For a little history, this this is a breed I have depicted often in my art, in different poses and different formats. The American version of this bird can have a tail up to about 6 feet in length, but the ones you'd see at shows are usually much shorter than that. Much better! That is the final mockup sketch. There were many in between which I'm not going to show you, but it was quite a long progression. 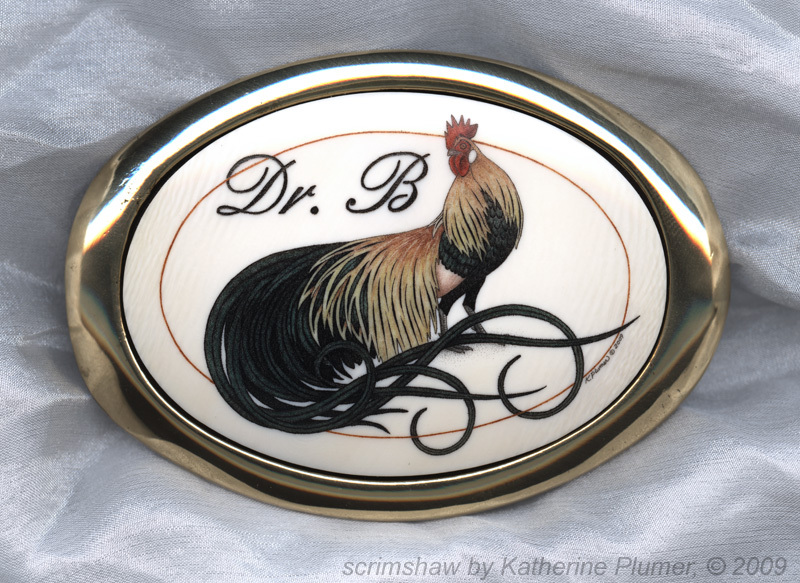 As this is a belt buckle, which people tend to think of as being engraved metal, I wanted to incorporate some scrollwork, but I had to break some of the rules of scrolls, because it was more important that the bird have tail feathers that could be somewhat realistic, instead of just swirling off into totally fanciful scrollwork. So there was a pretty fine line of what I could do, and I went back and forth on how many feathers should be curled, how to intersect and overlap them, and eventually this is just what felt right, so I went with it. 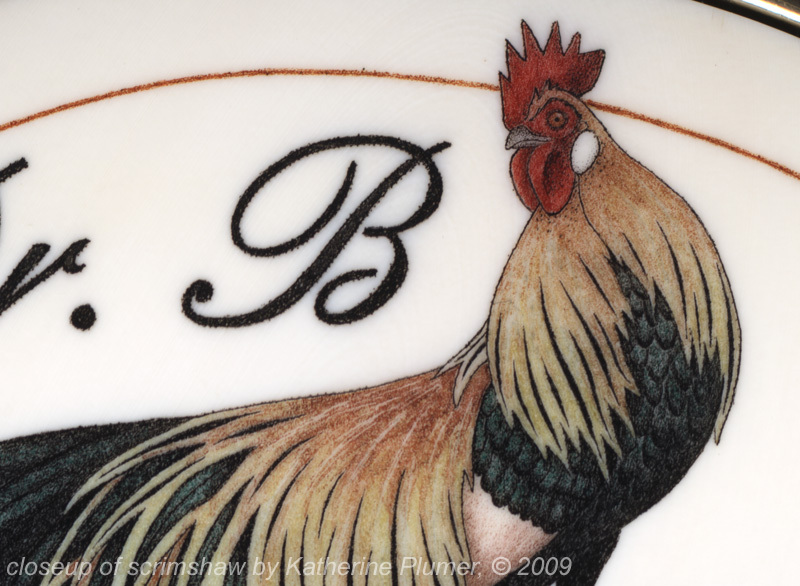 I was thrilled to find that font, because I could loop one of the letters around the border the same way that I did with the tail feathers. Now, to my absolute mortification, I found that the Higgin's red drawing ink does not stick. Crisis! 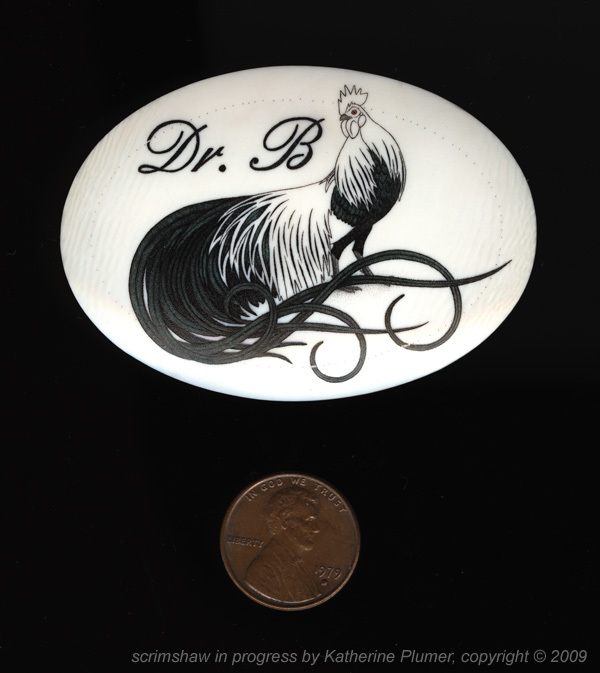 Most colors will stick down in the engraved dots but buff off the surface. Well, this didn't stick at all. So I had to do a crazy concoction of red, yellow, and brown just to give it some staying power. It worked. Crisis averted. Whew. I will be shopping for another brand of red ink (that's so weird!) 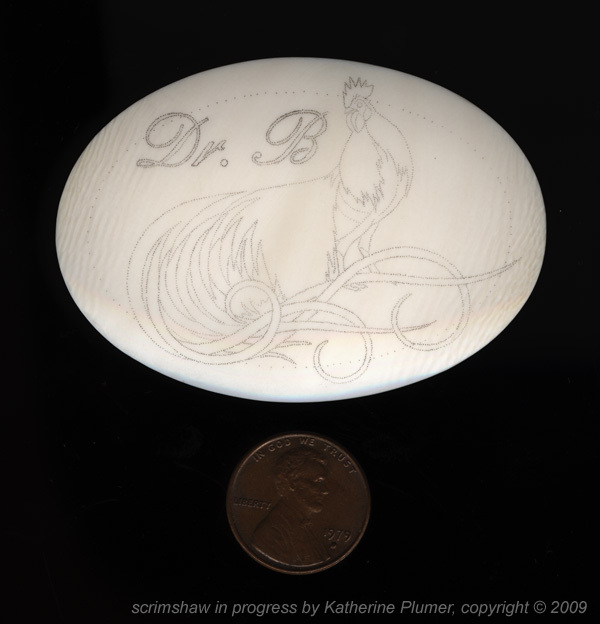 And as a side note, the inks are topped with a few layers of microcrystalline wax polish (which buffs down to a microscopically thin layer) to protect them. All that was left at this point was the border, signature, and to place the ivory into the buckle itself! I kinda lost track of how many colors went into this. At least 11, maybe 12. This might sound weird, but I'm just flat out amazed at how much this ends up being like a colored pencil drawing as far as the layering and everything, and I did not think I would be able to get this sort of look from scrimshaw. Love it! I have heard the phrase "over the moon" tossed around as a measure of how a recipient reacts to a piece, and I think that was definitely the case here. :-) This buckle is going to be a treasured piece. Thank you so much to everyone who helped make this piece possible. Wow, those are some beautiful designs. Maybe I should do something similar. 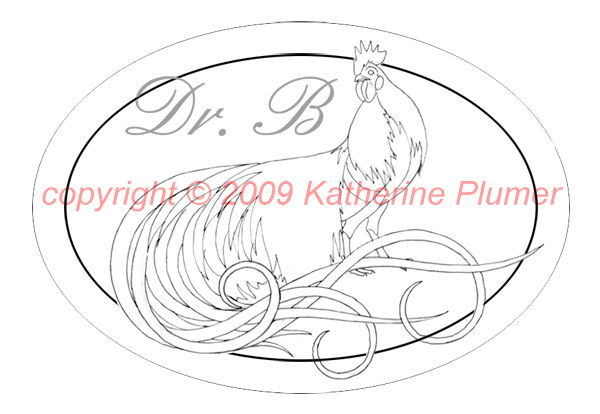 I've been scouring the net to find a lovely 'rooster' to use for a base for artwork on a future tattoo. I appreciate the compliment, but please do not use my work as the basis for your tattoo. This is a copyrighted image that took me countless hours to design.... Thank you. On a whim, for fun, I bought 5 piano key tops to try to scrim some bunny images for a thank-you gift. 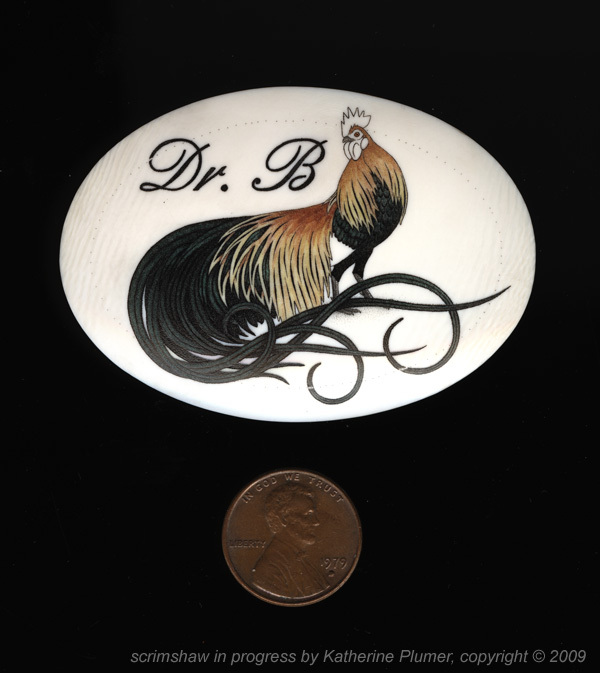 An online search for "how to scrimshaw multiple colors" brought me first to your dear peacock pendant, and then here. --> Your simple caption, "Scrimmed the gold areas with several colors of golden brown ink:", doubtless encompasses many hours and days of painstaking color layering. For these areas, if I may ask, did you start with the lightest yellow and work towards the darker browns, or vice versa? You seem to have worked each way, at different times for different pieces, and I am curious what you decided to do here. --> When you applied the protective wax, did you do so thoroughly, after each individual color, or only once when all was complete? 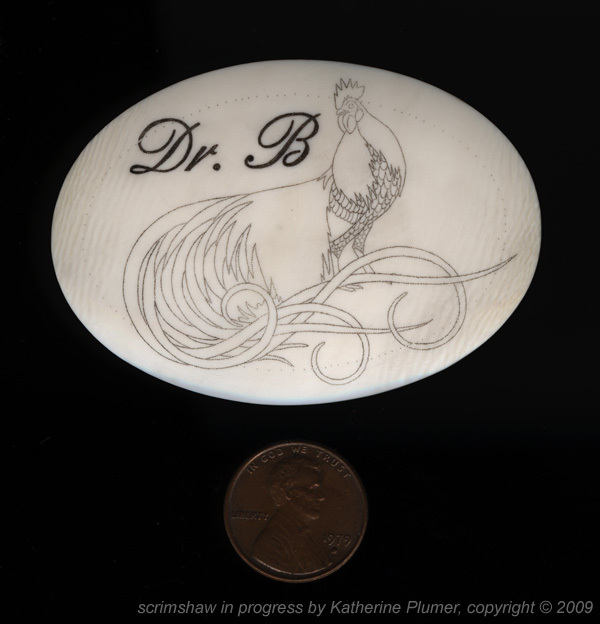 Do you apply a double-coating at the end, after having completed the piece? --> What kind of magnification setup do you have? I've inherited a magnifying glass/alligator clip setup which my husband used for soldering electronics. I hope it will be adequate. 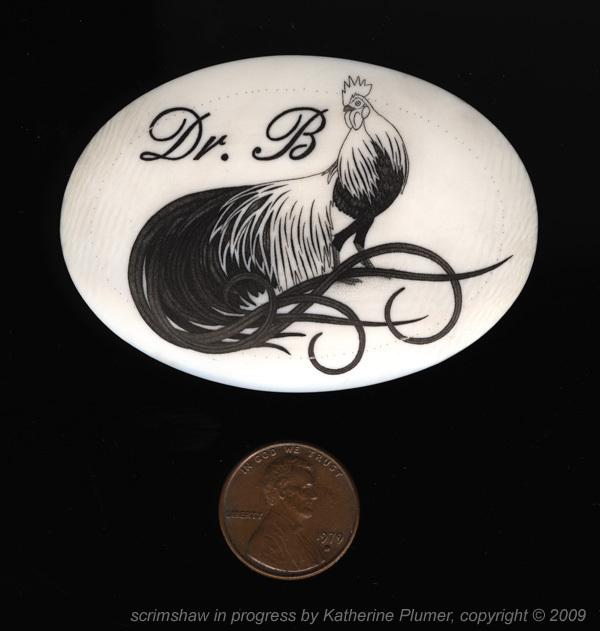 Your "'Trevor' (Shetland Sheep Dog) pendant" is the MAX! I love the linear treatment of the guard hairs (is that correct?) Also, your banner, under the title, "My life, under the microscope..." beautifully combines dots and lines. I can actually smell the animal (seriously!) looking at this image. Color adds a lot, but your black-and-white pieces have a richness all their own. Thank you in advance for responding to my questions, for sharing your work, and for encouraging others in this "Old Worldish" New World art form!